Megaphones have also been called bullhorns, speaking trumpets, loud hailers, and blow horns. They are portable instruments that are capable of being carried to whatever location the user feels necessary for being heard. By holding it up to the face and speaking directly into the narrow end of bullhorns, the sound then radiated through the device and out the other end. It is during the time the sound travels through the megaphone that it becomes louder than the natural voice can speak. The increased volume takes place because the natural sound of the voice is amplified by lowering the acoustic impedance of the vocal cords to match the impedance of the air. This also directs the sound waves created by the voice in the same direction the horn is pointed. During the process of using a megaphone, the sound of the voice is a bit distorted because of the frequency differences between the voice and the megaphone. Over the past several decades, the voice-powered megaphone has in many cases been replaced by electrically powered bullhorns. However, the voice distortion remains part of the package. 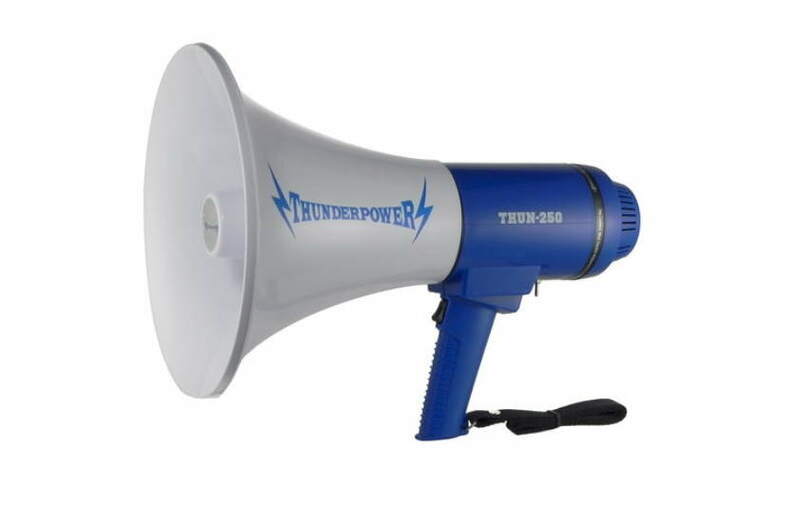 Although the electrically powered bullhorn has its technological advancements, they are still handheld devices that can be used as public address systems. It still amplifies the voice, but with greater power than the humble megaphone. That greater power brings about 90 decibels or more of powerful public address. This gives those who need to be heard a huge advantage when other public address systems like loudspeakers are not available. They are often used at political rallies, outdoor movie sets, sporting events, street demonstrations, and any other situation where people congregate. The handheld electronic version of the megaphone retains the shape of the originals, but they have a microphone positioned at one end and at the other is a horn speaker. They have a pistol grip and trigger switch which turns it on and off as desired. Of course, there are those who believe that bigger is always better and that includes makers of bullhorns and megaphones. Larger versions of the bullhorn are also available. They come with a shoulder strap to help support their weight, and there is a separate microphone that is attached to a cord and held in the hand. This allows speakers to remain visible to the crowds they are speaking to without hiding their faces behind the device. The shape of the megaphone determines the range sounds will be projected to. A narrowly shaped bullhorn will concentrate the sound more sharply than wider ones. When purchasing a bullhorn, it is necessary to consider price, weight, wattage, as well as the presence of shoulder straps and alarms. Karl T. Jessup is a blogger with a passion for technology and history. His favorite source for electronic megaphones can be found online here: www.thunderpowermegaphones.com.